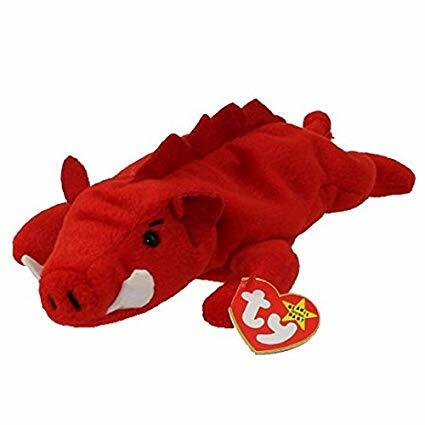 Grunt is a bright red razorback wild boar with black button eyes and black embroidered eyebrows in an angry expression. He has two, large white tusks coming out of his mouth, two tiny red ears and a line of red spines running along his back. Grunt is the sweetest Beanie Baby! Grunt was released on 7th January 1996. His Birthday is on 19th July 1995. Grunt is made from the same material as Snort, Tabasco, Pinchers and the red version of Digger. He was retired on 11th May 1997.